It’s been about two years since we published our article about radio straps and turnout gear. It has been shared throughout various magazines and training pages. A few readers asked about our ideas and pointed out that we didn’t address enough when firefighters are wearing the self-contained breathing apparatus (SCBA). We took that point and went out to take a few more photos to assist with our findings. The original article discussed the differences between wearing your radio strap either under or over your turnout jacket. We know the advantages and disadvantages of both without an SCBA on. To the right we have the radio strap under the coat with the SCBA on. It is beneficial because it protects the radio and the cable of the extended speaker-mic. When all buttoned up, the speaker-mic may be clipped on to the front closure flap. 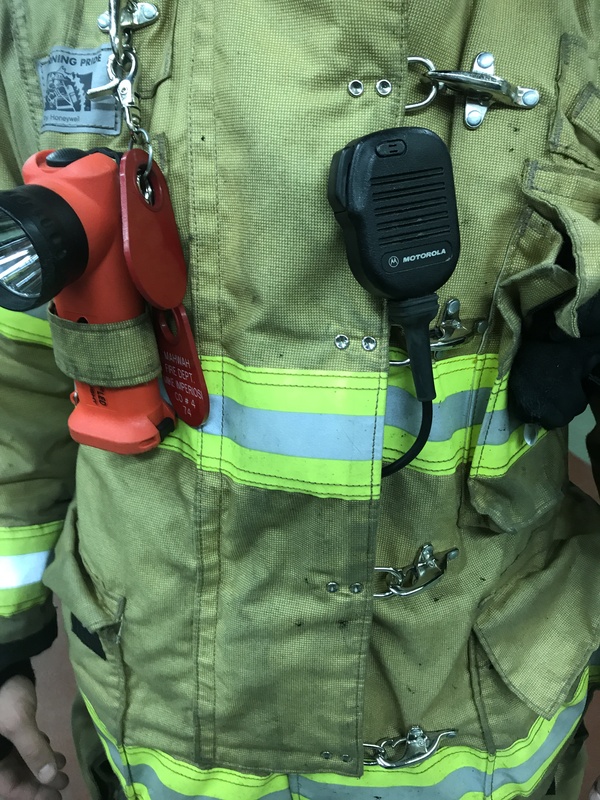 This allows it to be accessible in a functional area when on air compared to using the collar tab or chest tab that often falls inline with the shoulder strap of the SCBA. Also with these morning pride jackets, it take a little effort to fold up the name plate in order to access the top controls of the radio should you need them. The radio strap over the coat and under the SCBA method is another configuration that is used. This leaves everything exposed to the elements. The speaker-mic is accessible and not hindered at all. The SCBA straps secure the radio and straps however the waist strap interferes with the use of the radio controls. This may be overcome by extending the radio strap which will leave the radio hanging lower. This style above is when the radio strap is equipped last, on top of the SCBA. This leaves everything out and the radio strap unsecured. This also allows for the radio controls to be easily operated including the speaker-mic. This style unfortunately heightens a firefighter’s entanglement potential because the unsecured weight of the radio will allow it to move in all directions. Using an anti-sway strap may be difficult in this situation because of the way the coat will have to be manipulated in order to access the belt area of the pants. Here’s a quick method that was shared to us by one of our followers. If you don’t have a radio strap or don’t like to use the radio pocket on the jacket, you may use the standard interior pocket of the jacket. This is best used when you can “set and forget” the controls of the radio because once buttoned up, you will not be able to access the controls. Then the speaker-mic may be affixed to the front closure of the jacket in a similar manner that the radio strap under the coat method is used. Another potential con of this method is that it will be bulky in the area of the radio. Once the SCBA is equipped, it may even sit more to one side. Again, this is just another potential way of wearing your radio. As mentioned earlier in this article, here is the difference between using the coat’s mic tab versus the flap of the front closure. Again, both have pros and cons. Using the coat’s mic tab will better secure the mic however it may be keyed up unintentionally when moving around. Using the front closure of the coat may be less secure however it will allow for better usage.